H. Wayne Hooper, Jr., MD returned to Gallatin, TN in the summer of 1983 to begin the practicing of Family Medicine. Wayne was married in the summer of his sophomore year in college in 1974, to Barbara Brooks, also of Gallatin. Together they have parented four children to adulthood, Hal Brooks (1976), Michael Hee (1977), Sarah Maria (1980) and Christie Deanne (1981). The children, in turn, have all married and are themselves parents of, at last count, Wayne and Barbara's nine grandchildren. Three of the children and two of their spouses are physicians, and one of the spouses is a dentist. Wayne and Barbara maintain a home in Gallatin, are enthusiastic hikers, and while Barbara continues to spend much of her spare time playing tennis, Wayne remains an avid cyclist, hobby woodworker, and private pilot. Wayne is currently Board Certified in Family Practice and continues a full-time outpatient practice in Family medicine at St Thomas Medical Partners - Sumner Medical Group. 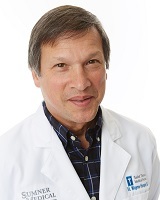 He is the Medical Director for Gallatin Health Care and is a member of the Tennessee Medical Association, the Tennessee Academy of Family Practice and the American Academy of Family Physicians.